Frederik March 04, 2018 Comment? 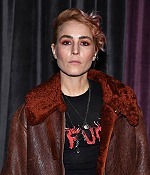 Noomi has continued her streak of appearances at the Paris Fashion Week, showing up at the BYREDO x Off-White Presentation and the Givenchy runway. Pictures from both events have been added to the photo gallery, alongside some wonderful additions from Friday’s Césars.